We check algorithms of 566 search engines every 12 minutes to ensure your top search engine rankings. Search engines twist their algos now and then to make them harder to process with software. In other SEO software companies it's become acceptable that when such a change occurs, it takes about a week to get SEO tools back to work. SEO PowerSuite is different. A separate team of developers is monitoring search engines and adjusting software in next to no time! You get the most feature-rich SEO software pack. The software is already working and bringing our users excellent results. However our SEOs and analysts and working to further enhance the software and provide you with every feature that may boost your website's profitability. We listen to requests and ideas from our software users. SEO PowerSuite uses only proven techniques. Our own site ranks #1 for seo software - a 26 mln competition keyword - with the help of SEO PowerSuite. A team of SEO practitioners who know search engine optimization from their own experience constantly recheck the methods used by our tools. So what's offered in SEO PowerSuite is proven to really work. This SEO software is baby-simple. We wanted to be the first company to release smart software for professional optimization, and yet make it a total no-brainer, easy to use for a newbie. The problem was solved: built-in wizards with a pile of SEO advice are guiding you through every step of website analysis, optimization and promotion. Unlike other SEO tools, SEO PowerSuite won't send you to read any SEO or software tutorials. This is what you can call user-friendly. All software features are approved by real users. Whenever a new feature is added, we show it to a team of beta testers whom we pick from our own users. An equal number of SEO newbies and professional SEOs make sure the software is easy-to-use for a complete novice and for an experienced SEO. We know how to make software absolutely precise and efficient. Each algo is double-checked by a team of accurate engineers and SEOs. After that, every software feature gets checked and assessed by an independent SEO expert, to make sure your SEO software provides proven data and gives you utterly reliable guidance. SEO PowerSuite tools guarantee top Google position. Per each hundred of our users, only two don't send us success reports! Are you already a user of SEO PowerSuite tools? We're waiting to hear your story! This software has the most fast-growing user base. Over the past year, our users' list has seen three-digit growth which is already exciting. However the biggest point is that 2008-2010 showed that SEO PowerSuite alone is getting as many new users as the other two from the top 3 SEO tools put together. Clients from 153 countries all over the world rely on our software. Our users have the widest range of reporting facilities at hand. No other SEO software will offer you such a rich choice of facilities for making SEO data available outside the program. SEO PowerSuite was made to support most popular reporting formats Adobe PDF and HTML plus the software generates .txt, .csv, .html and .xml exports. We're developing SEO PowerSuite reports based on real-life examples. We're conducting surveys and analyzing data from SEO companies and individual webmasters. Putting all experiences together, we're developing reports that perfectly suit today's SEO needs. SEO PowerSuite offers extra flexibility at making reports. Reports from SEO PowerSuite software are fully customizable. Besides offering numerous report templates, the software lets the user customize the report branding it with a company logo and colors, choosing which report sections and search engines data to include, edit introductory text etc. Unlike other SEO software, SEO PowerSuite tools allow adjusting absolutely everything in the reports. Our users enjoy the benefits of our insider list. If you're the user of SEO PowerSuite software, you're joining the limited insider list. Only users on this list are the first to get new features, updates on newly-emerged SEO strategies and invitations to SEO contests and other events we run. We provide each user with unparalleled customer support. A team of professionals is working to provide help to each user within shortest time. We made a step further than conventional support services. Our team tries to even help resolve issues beyond our control or responsibility, not directly relevant to the software — such as problems connecting to your mailbox or FTP due to the Internet Service Provider. No other SEO software runs equally well on Windows, Mac OS X or Linux machines. SEO PowerSuite is cross-platform. The product will run smoothly on a machine with any supported operating system, be it a Windows PC, a Linux-based machine or a shining new MacBook. We listened to our users and developed a convenient and customizable working environment. We did our best to make data management and storage logical. Besides to make the software fit individual requirements, we developed a number of customizable workspaces with flexible filters. Today's SEO PowerSuite workspaces offer several levels of customization that suit the most demanding and uncommon taste. For the huge volumes of data today's SEO has to manage, SEO PowerSuite is the most convenient solution. This SEO software works in full conformity with search engines. We take care to deliver high-quality software that fully conforms to search engines' requirements. SEO PowerSuite tools will use only legal, or white-hat SEO techniques. Besides it'll prevent you from being hit by others doing black-hat SEO. SEO PowerSuite tools are perfectly safe. Unlike other SEO tools, SEO PowerSuite software leaves no traces of its activities, be it on your website, in your emails, or elsewhere. After you optimized your website with the software, it gets powerfully tuned up and gains rankings fast, but looks perfectly natural to search engines. This software is totally search engine friendly. We've gone an extra mile in the search engine friendliness of our software. Enhanced human emulation settings, rotating user agents and advanced ability to work from behind proxies let us avoid the common problem with search engines detecting SEO software activities. SEO PowerSuite supports search-engine-standard API keys. SEO PowerSuite is unique in using Google, Yahoo! and Bing APIs to ensure you will never abuse these search engines or violate their policies. We offer extra education free of charge. Every user of SEO PowerSuite software always has a complete SEO guide at hand. The SEO book provided by our senior SEO consultant lets the user go deeper in SEO art, and pass necessary tests to qualify for the SEO certificate. Each user will get more out of their software copy and will be able to advertise their SEO skills. The base of supported search engines is constantly growing. With the fast growth of our user base and widening of our geography, we're adding dozens of new local search engines to let users promote in any and as many targeted search engines as needed. SEO PowerSuite does not limit its users in the number of promoted websites and the number of targeted keywords. You will manage as many SEO campaigns as needed within the same copy of software. And you can broaden your keyword list, thus maximizing chances of any webpage to get top profit-generating rankings. SEO PowerSuite includes the only software that works like a full-fledged email client. The link management tool of SEO PowerSuite is the only software in the industry that works like a fully-functional email client, letting the user work with outgoing and incoming mail within the software and allowing to keep all partner activities within one tool. SEO PowerSuite is the only software that lets you work at different SEO tasks simultaneously. We designed the toolkit so that it saves you time while you're working to promote your websites. Unlike other SEO software users, those who have SEO PowerSuite are able to run several SEO tasks concurrently. This literally slashes time spent on search engine optimization. Due to the composition of SEO PowerSuite as a four-tool pack, the possibilities to further develop and enhance each tool are unlimited. Whatever curves the SEO industry makes, we will be able to smoothly adjust our software for the users within shortest time. 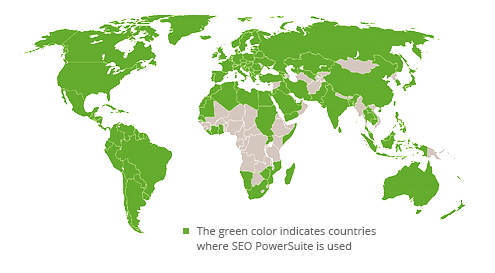 SEO PowerSuite supports multi-language websites and keywords. SEO PowerSuite is one of the few tools that work seamlessly with websites using non-English symbols and optimizing for non-English symbols and this is the only software that works with Asian languages. SEO PowerSuite works for all kinds of websites. EO PowerSuite tools have proved effective when promoting all kinds of websites. Users reported top 10 results for their blogs, homepages, internet shops, forums, directories etc. Numerous tests by inexperienced users and professional SEOs showed that SEO PowerSuite software works 17 to 62 times faster than other popular SEO tools. This SEO software was reported to be effective for all niches. The universal algorithm and smart analysis facilities of SEO PowerSuite software have been designed to make the software equally effective to gain websites #1 placement in any niche, be it house insurance, liquid helium biochemical equipment, exotic cuisine, green initiatives or whatever — the list of fields where our users are ranking #1 is growing endless. Every 3rd SEO business relies on SEO PowerSuite. From SEO companies formed in 2010, every third one is regularly using all tools from the SEO PowerSuite pack. Most companies have been expanding and placing orders for extra SEO PowerSuite licenses. Fortune 500 companies are using SEO PowerSuite tools. We are happy to have dozens of Fortune 500 enterprises in our user base, as well as thousands of smaller businesses. All confirmed SEO PowerSuite software helped them get top 10 rankings in targeted search engines.